We are breeders of Burmese, Burmillas both longhair and shorthair and Tiffanys. We are registered with NZCF and have been breeders for over 30 years of beautiful elegant traditional english type burmese. Visitors are welcome to come and view our kittens and breeding stock, either by emailing us themanorhouse@clear.net.nz or by phoning 03 318 0013. We enjoy talking to cat people, breeders both here and overseas. We introduced the Tiffany to NZCF in 1996 and have been working hard to produce the best burmese type we can. We are particularly proud of him. Soon we will introduce the golden gene to our Tiffanys and burmillas and a whole new world open to us. She achieved champion status quite quickly as did her mother. We introduced the Tiffany to NZ because we believed there was a niche market out there for a cat with an easy care coat, the illusion of long hair, but without all the work of a full longhair. The Tiffany is a semi long haired cat of burmese type. Because the original cross mateing was burmese and chinchilla we can get solid colours and tipped, shaded, smoke or tabbys with a silver or golden undercoat. They have the wonderful burmese outgoing nature, high level of intelligence. 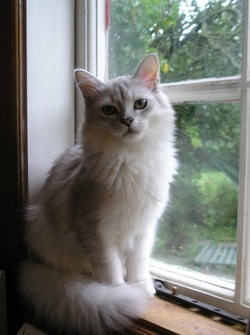 Burmillas both longhair and shorthair have originated from the same original cross mateing (burmese/chinchilla) However in NZ the type for burmilla is not burmese type. It is a more heavier cat with a squarer head, a coat with a lift and green eyes. 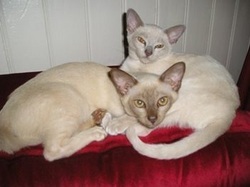 They are available in all burmese based colours plus black and either tipped, shaded, smoke or tabby coat patterns. They are not quite as outgoing as burmese(some people prefer this) but still very people orientated and make wonderful pets. This picture is of Avon Diamonds are Forever (nickname Lily) she is a black tipped silver. 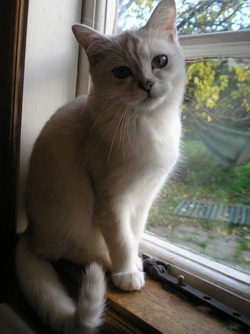 We also have her father (CH Copycat Puck) who is our current burmilla stud. He is a black tipped silver and carries the longhair gene. He is also Ziggys father. We purchased a Golden Chinchilla who we are mateing to our Burmese boys in the hope of getting Golden Burmillas. The NZ Cat Fancy have now accepted goldens and a standard is being adopted.